This is a super clean Birmingham Machine that came from a one man shop building construction fixtures. 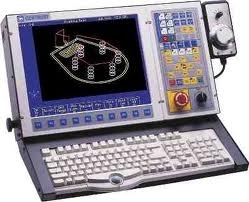 The machine features the Centroid M400 Controller known for ease of programming and powerful features. It has a 5 HP spindle motor with fully programmable spindle speeds, automatic power drawbar and 40 taper spindle. We offer this machine new from Atrump for $50,000. Table Size 12" x 60"
Dimensions (L x W x H) 75" x 82" x 92"
This Atrump B6FC Machine came from a research and development division of a large company. The machine is excellent shape and is fully supported by Atrump and Centroid. The machine features a new 2015 Centroid M400 Controller known for ease of programming and powerful features. It has all new 29 in/lb motor in X,Y and Z, and we installed new super precision duplex bearings in X and Y axes to achieve maximum tolerances. It has a 5 HP spindle motor with fully programmable spindle speeds, automatic power drawbar and 40 taper spindle. We offer this machine new from Atrump for $50,000. Travels X 39 ", Y 22" , Z 23" Quill 6"
SPECIAL PACKAGE INCLUDED WITH MACHINE PURCHASE !!!!! This is a very nice Used HH Roberts Topwell TW-96 Bed Mill with upgraded CentroidCNC Control, Head is 5-HP Inverter drive, with 40-Taper Spindle, Made in Canada by H.H. Roberts Machinery Manufacturing. Handwheels on X and Y Axes for manual operations. Machine was used to cut ABS plastic tubing in a rotary table application. This used machine is immaculately clean and ready for your application. It was set up for a rotary index application, so the wiring of the miscellaneous m function is there as well as an air solenoid valve for an air brake on the rotary. Ballscrews on X,Y, and Z axes. Table size: 10 x 50"
X-Axis travel: 32" Y-Axis Travel: 20" Z-Axis Travel of Head on Column: 21" Quill travel: 5"
208 to 230 VAC 3-phase and 120 VAC single phase. This used milling machine is a really nice Heavy Duty Box Way Frame in immaculate condition. Save $30,000 off of new. Overall dimension 13" x 54"
Longitudinal travel 40" Cross travel 20" Head travel 24"
Floor area 87.8" x 74.8" Machine height 92.5"
Hurco Hawk 40/SSM, 3-axis CNC Bed Mill. Table 58" x 13", Max work weight 990 LBS. Spindle motor 5HP. Drive: 2-SPEED BACK GEARED, 80-3800 RPM. Nose to Table MIN/MAX 3.54"/23.6", Center to Column Ways 20", Quill DIA 4.33". Travels:(X)40" x (Y)20" x (Z)20", Quill Travel 6". Programmable Feedrates 250 IPM. Hardened and Ground Y/Z-Axis Ways, Auto Lube. Short Description: Hurco Hawk 40/SSM, 3-axis CNC bed mill.